After trading away first basemen Adam Lind to Seattle and Jason Rogers to Pittsburgh, the Milwaukee Brewers signed Chris Carter, who was not tendered a contract by the Houston Astros. The 29-year-old signed a one-year deal for $2.5 million and can earn another $500,000 in incentives. Carter hit 24 home runs and drove in 64 runs for the Astros last season, but hit just .199. He also struck out 151 times. Carter was traded from Oakland to Houston before the 2014 season and hit 29 home runs while driving in 82 runs in 148 games that year. But he also led the American League in strikeouts with 212. In 2014, he clubbed 37 homers with 88 RBI in 145 games but struck out 182 times. The Brewers made room for Carter on the 40-man roster by designating catcher Josmil Pinto for assignment. Pinto had been claimed off waivers from San Diego last month. Former Brewers’ closer Trevor Hoffman finished fifth in the baseball writers’ voting for the Hall-of-Fame. He received 67.3% of the 440 votes, 34 short of the required 330 needed for election. It was the first year on the ballot for Hoffman, who played 18 seasons, most of them with San Diego. He finished with 601 saves, ranking second all-time. 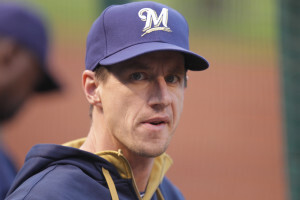 The Milwaukee Brewers announced their postseason award winners today as voted by members of the Milwaukee Chapter of the Baseball Writers Association of America (BBWAA). Right fielder Ryan Braun earned Brewers Most Valuable Player for the third time, hitting .285 with 25 home runs, 84 RBI and 24 stolen bases in 140 games. He was selected to his sixth All-Star game and produced his fourth career 20/20 season (home runs/stolen bases). First baseman Adam Lind finished second in the voting. 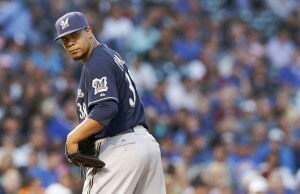 Francisco Rodriguez was voted Brewers Most Valuable Pitcher. Rodriguez went 1-3 with a 2.21 ERA and 38 saves. The 38 saves is tied for fifth in the National League. Rodriguez was selected to his sixth all-star game. Adam Lind earned Brewers top Newcomer ahead of pitcher Taylor Jungmann. Jeremy Jeffress took home Brewers Unsung Hero honors ahead of fellow reliever Will Smith. Jonathan Lucroy captured his third consecutive Good Guy Award, ahead of Kyle Lohse and Scooter Gennett. Jorge Lopez held the San Diego Padres to three runs over five innings and the Milwaukee Brewers went on to knock off the San Diego Padres 4-3 in their series opener at Petco Park. Thanks to Jean Segura’s two-run home run in the top of the sixth inning, Lopez was able to earn the victory in his big-league debut. Segura’s home run gave the Brewers the lead a t 4-3 and closed out the scoring for the night. Anthony Rizzo had three hits and scored three runs while pinch hitter Jorge Soler clubbed a three-run homer to lead the Chicago Cubs to a 9-5 win over the Milwaukee Brewers on Monday night at Wrigley Field in Chicago. The Cubs magic number to clinch a playoff spot dropped to four. The last time the Cubs played meaningful baseball in the month of September was in 2008 when they last made the playoffs. They’re chasing the Pittsburgh Pirates for the top Wild Card spot in the National League. Adam Lind and Khris Davis both homered in the loss for the Brewers, but Wily Peralta made it just four and two-thirds innings, allowing six runs on eight hits. Peralta walked four and struck out two. His E-R-A in the last two starts has bloated to eleven-point-five-one. The Brewers have dropped eight straight to the Cubs. Game two of the series is tonight. Anthony Rizzo and Jorge Soler each drove in two runs and Dan Haren picked up his first victory for the Cubs as Chicago knocked off the Milwaukee Brewers 6-3 at Wrigley Field on Tuesday night. The Cubs won their 5th straight and 11 out of the last 12 games. 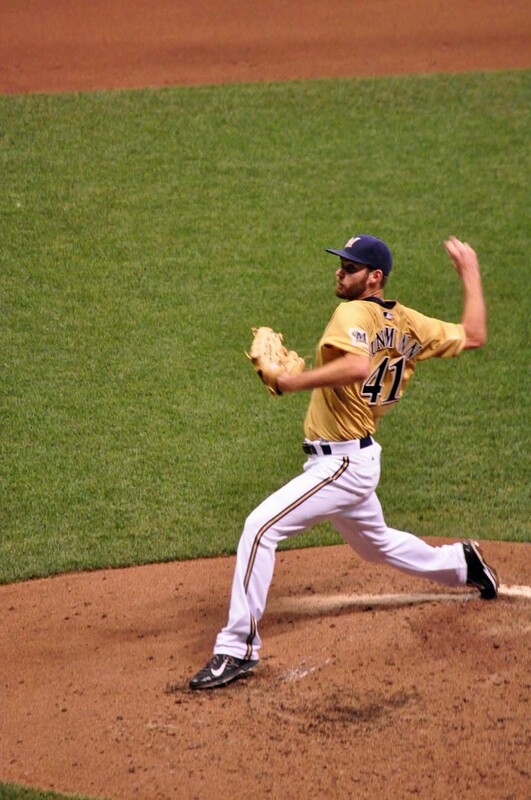 Brewers right-hander Taylor Jungmann (6-4) struggled with his command and lasted just 2 2/3 innings. He gave up four runs on five hits with three walks and three strikeouts. 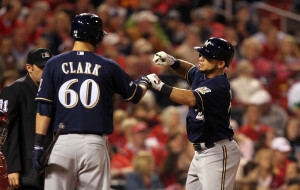 Adam Lind homered and tripled for the Brewers, who have lost 14 of the last 20 games. The Cubs climbed to within 2 1/2 games of the Pittsburgh Pirates, for the first spot in the National League Wild Card race. Game two of the series is tonight at Wrigley Field. Khris Davis clubbed a pair of three-run home runs to power the Milwaukee Brewers to a 10-1 win over the San Diego Padres at Miller Park on Thursday afternoon. Davis homered for the first time since July 18 when he went deep against Padres starter Odrisamer Despaigne in the third to give the Brewers a 4-0 lead. Davis also clubbed another 3-run shot in the eighth off of Kevin Quackenbush. Matt Garza (6-12) pitched seven solid innings, allowing a run on two hits with two walks and five strikeouts to earn the win. The Padres only run came in the fifth when Melvin Upton Jr. hit a home run off of Garza. Adam Lind also had three hits and three rbi’s for the Brewers, who took three of four in the series. 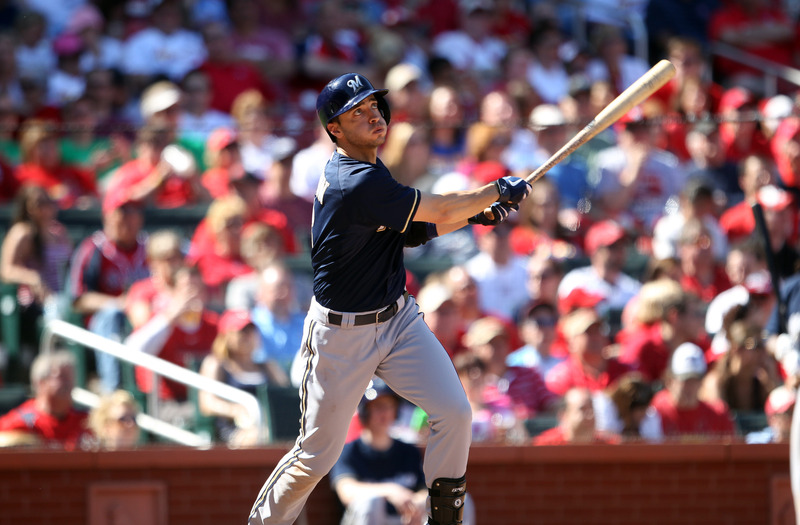 The Brewers open a three game series against the St. Louis Cardinals at Miller Park tonight. Wily Peralta was reinstated earlier Tuesday after a two-month stay on the disabled list and pitched six solid innings to lead the Milwaukee Brewers to a 5-2 win over the San Francisco Giants at AT&T Park. Peralta (2-5) allowed 2 runs on 5 hits, to go along with two walks and three strike outs. It’s the first win for Peralta since May 6. Gerardo Parra did the bulk of the work offensively, finishing a home run shy of the cycle. He also scored three of the Brewers five runs. Adam Lind also returned to the lineup and drove in a pair of runs, helping the Brewers snap a three-game losing streak. The loss goes to Matt Cain who fell to 2-2. Francisco Rodriguez recorded his 23rd save in as many opportunities after blanking the Giants in the 9th inning. The series is tied at a game apiece with the rubber match this afternoon in San Francisco. The Milwaukee Brewers dropped 3 of 4 games in the desert, falling 3-0 to the Arizona Diamondbacks on Sunday at Chase Field in Phoenix. It was Arizona’s second straight shutout, the first time they’ve collected back-to-back shutouts since June 3-4 of 2011. Atlanta rookie Manny Banuelos turned in a solid performance and beat the Milwaukee Brewers 4-3 on Tuesday night at Miller Park. Banuelos held the Brewers to a run on five hits and three walks in 5 1/3 innings to pick up his first victory. Entering the home stand, the Brewers averaged 7.6 runs a game during a seven game road trip. Back home at Miller Park, the Brewers have scored three runs in back-to-back losses. Jonathan Lucroy and Adam Lind both homered, but both were solo shots. Pinch hitter Shane Peterson also doubled to left, driving in a run for the Brewers. 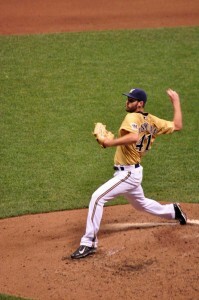 Tyler Cravy made his second career start for the Brewers, allowing three runs on eight hits in six innings and was saddled with his second loss in as many decisions. 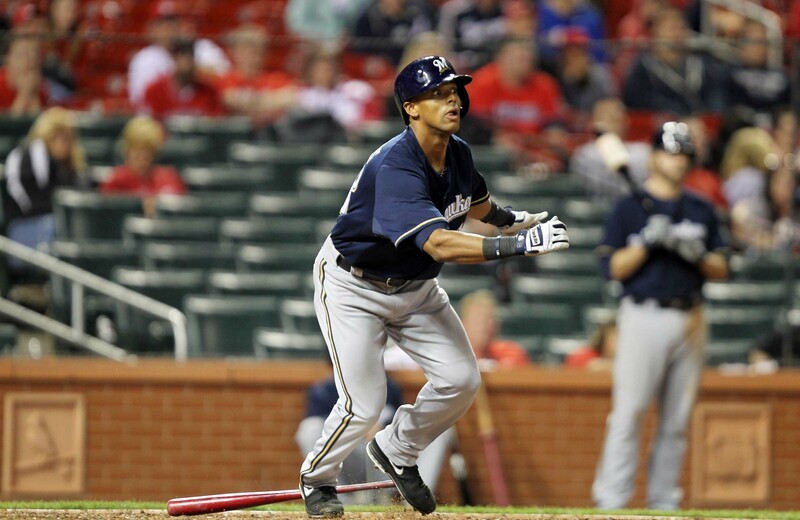 Khris Davis returned from the D-L and got a start in left field. He had one hit but narrowly missed a pair of home runs. Davis also made a nice sliding catch in foul territory. How much will Davis play moving forward? Manager Craig Counsell said most of the playing time in left field will belong to Gerardo Parra. Parra’s .309 average ranks seventh in the National League. The Brewers will send Mike Fiers to the mound in the series finale today, trying to salvage one game against Atlanta.